All New Version 2.7 Now in the App Store and Google Play! 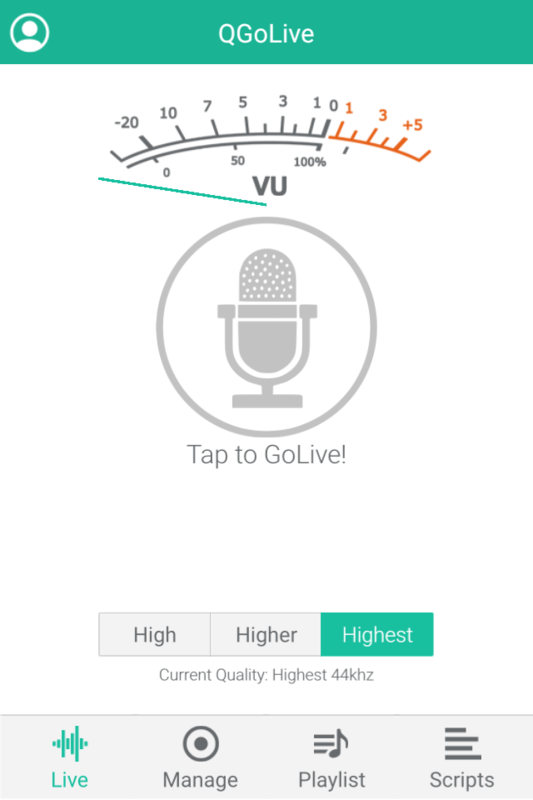 Tap the microphone to start the app. This screen allows the user to connect to the receiver at the radio station. Log in with your provided credentials (they will be remembered). Use this function to play out cuts recorded and edited in external apps such as Twisted Wave or any audio program that can open its output in another program (or a browser that can open downloaded files in another app). 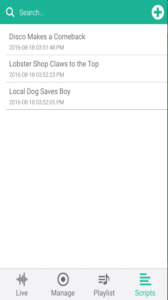 QGoLive allows you to write or dictate scripts which you can read while live. You can also insert edited audio directly into your script for playback during a live report. To write a script, click the scripts tab and then the “add” icon at upper left. The App has three major components – Live, Playlist, and Scripts. QGoLive allows reporters to quickly get on the air in broadcast quality simply by launching an app and pressing one button. It is a software to software solution and does not require the purchase of hardware at the studio end. The transmit app runs on iOS or Android devices. 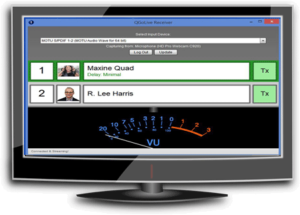 The receiver application runs on PC or Mac. We can also provide an Android based hardware receiver with balanced XLR inputs and outputs so you don’t have to tie up a computer for the receiver. 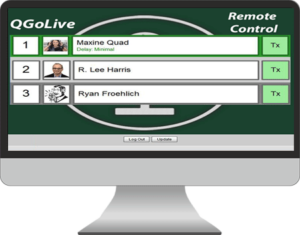 The primary purpose of QGoLive is to replace the live shots that are typically broadcast in phone quality because the reporter has just arrived on the scene and has not had an opportunity to set up equipment for a broadcast quality live shot. This screen allows the user to connect to the receiver at the radio station. Log in with your provided credentials (they will be remembered). To connect hit the play button in the center of the screen. This will send audio to the station receiver and send cue audio to the app. To hit the button (pause) again. (Note: If the app appears to freeze or get stuck at any point, perform a forced close). Use this function to play out cuts recorded and edited in external apps such as Twisted Wave or any audio program that can open its output (mp3) in another program (or a browser that can open downloaded files in another app). 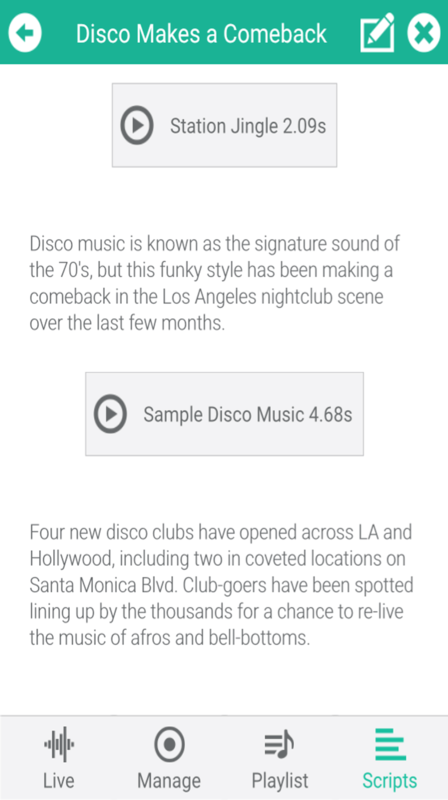 To select a cut to play on air – click the speaker button and select your cut from the pulldown. Your cut will then be ready to play on air. You can preview it as often as necessary, whether you are connected to the receiver or not. You can add more cuts and play them in the order of your choosing. You may drag cuts to change their position. To play these cuts on air as part of a wrap simply go to the “live” tab, connect, and then switch back to the “playlist tab”, and fire off the cuts at the appropriate time. Imported cuts can be managed in through the “Manage” tab. Clicking the delete button will remove the cut from the pull down for the playlist tab. Finally, imported cuts can also be added to and played from the scripts tab. When you get to the point where you wish to insert your edited audio, click the speaker icon at the upper right. It will present you with a list of available cuts. Select the cut or cuts you wish to include and they will be placed into your script. 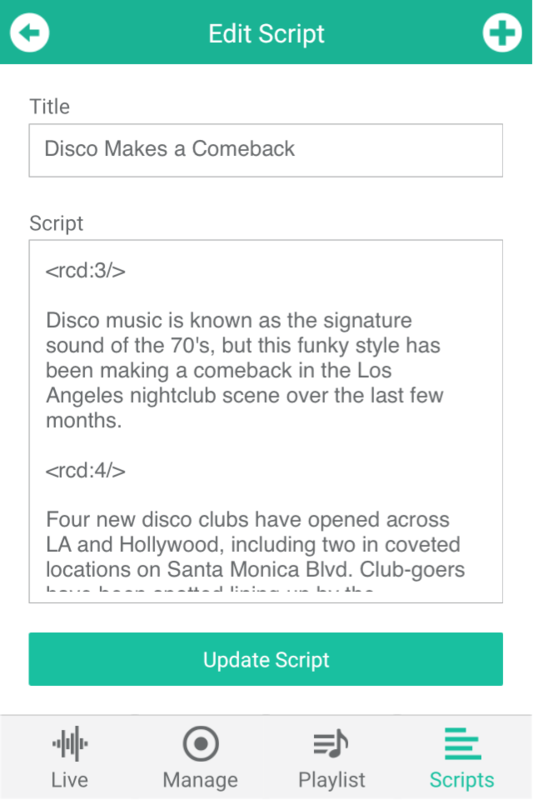 Click “add script” to save your script. When you are ready to air your report, connect to the station via the “live” tab. Then switch to the scripts tab and select the script you wish to use for your report. You will see a screen with your text and audio clip(s). Clicking the audio cut button will play the audio on your app and also over your live stream. The cut will countdown during playout. 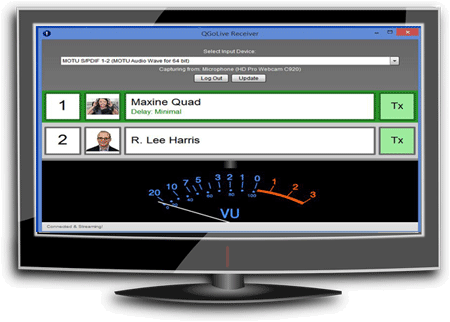 The QGoLive receiver runs on a PC or Mac at the radio station. It receives audio from apps in the field and sends cue audio to those apps. The receive audio is heard through the computer’s default playback audio card. 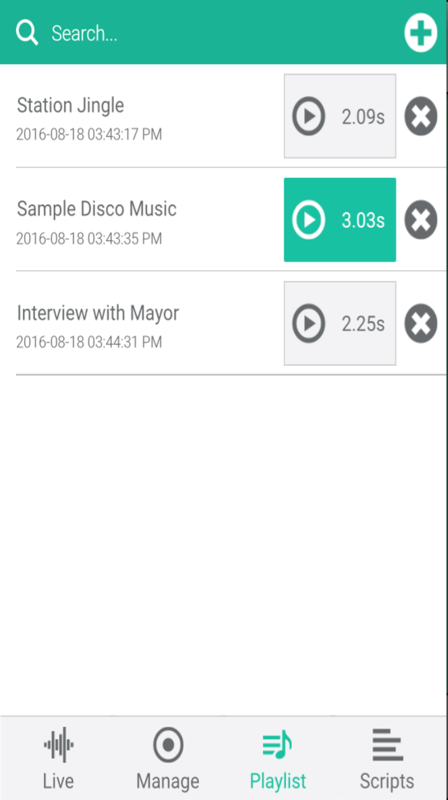 Any audio card set up for recording purposes may be used to feed cue audio to the apps. Any number of logged in apps may call into the receiver. All will get cue. The first app to connect will be ready to be received and go live by default. 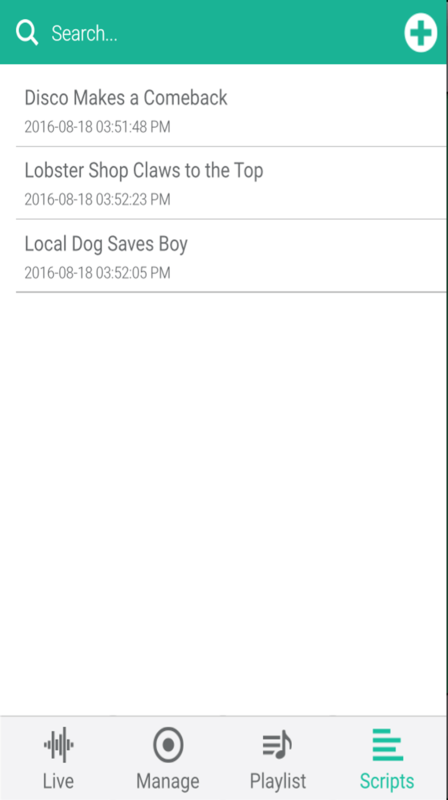 To select a different app (reporter) click the bar with that reporter’s name. (This can also be done via the provided remote control application). To interrupt cue audio to a connected app click the green TX button next to the reporter’s name (do this when recording a reporter for later airing) . Click the button again to restore cue. You can also manually disconnect a reporter by right clicking on the bar with the reporter’s name. You can run multiple instances of the remote in your studios and newsroom to see which reporters are available to go to air and to select them for air. As with the main receiver you can click the TX button to drop cue to a reporter and click it again to restore cue. Please fill out the form below for a free demo account. Your demo account will allow 1 concurrent connection and 1 demo user account with which you can test all of the functionality of QGoLive! NOTE: QGoLive Desktop, Receiver & Remote all REQUIRE the Adobe AIR runtime. Please visit https://get.adobe.com/air/ download and install AIR. We’re interested in your feedback! Do you have any questions, comments, or suggestions pertaining to QGoLive? It is a software to software solution and does not require the purchase of hardware at the studio end. The transmit app runs on iOS or Android devices. The receiver application runs on PC or Mac. 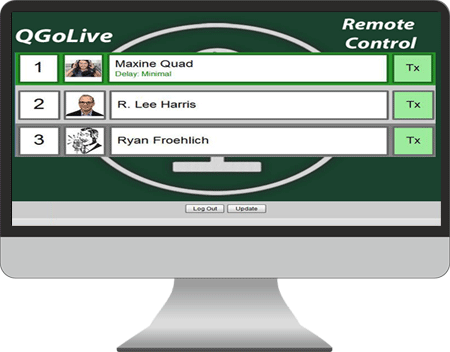 The primary purpose of QGoLive is to replace the live shots that are typically broadcast in phone quality because the reporter has just arrived on the scene and has not had an opportunity to set up equipment for a broadcast quality live shot. QGoLive ("QGoLive") operates qgolive.com and may operate other websites. It is QGoLive's policy to respect your privacy regarding any information we may collect while operating our websites. Like most website operators, QGoLive collects non-personally-identifying information of the sort that web browsers and servers typically make available, such as the browser type, language preference, referring site, and the date and time of each visitor request. QGoLive's purpose in collecting non-personally identifying information is to better understand how QGoLive's visitors use its website. From time to time, QGoLive may release non-personally-identifying information in the aggregate, e.g., by publishing a report on trends in the usage of its website. QGoLive also collects potentially personally-identifying information like Internet Protocol (IP) addresses for logged in users and for users leaving comments on qgolive.com blogs/sites. QGoLive only discloses logged in user and commenter IP addresses under the same circumstances that it uses and discloses personally-identifying information as described below, except that commenter IP addresses and email addresses are visible and disclosed to the administrators of the blog/site where the comment was left. Certain visitors to QGoLive's websites choose to interact with QGoLive in ways that require QGoLive to gather personally-identifying information. The amount and type of information that QGoLive gathers depends on the nature of the interaction. For example, we ask visitors who sign up at qgolive.com to provide a username and email address. Those who engage in transactions with QGoLive are asked to provide additional information, including as necessary the personal and financial information required to process those transactions. In each case, QGoLive collects such information only insofar as is necessary or appropriate to fulfill the purpose of the visitor's interaction with QGoLive. QGoLive does not disclose personally-identifying information other than as described below. And visitors can always refuse to supply personally-identifying information, with the caveat that it may prevent them from engaging in certain website-related activities. QGoLive may collect statistics about the behavior of visitors to its websites. QGoLive may display this information publicly or provide it to others. However, QGoLive does not disclose personally-identifying information other than as described below. QGoLive discloses potentially personally-identifying and personally-identifying information only to those of its employees, contractors and affiliated organizations that (i) need to know that information in order to process it on QGoLive's behalf or to provide services available at QGoLive's websites, and (ii) that have agreed not to disclose it to others. Some of those employees, contractors and affiliated organizations may be located outside of your home country; by using QGoLive's websites, you consent to the transfer of such information to them. QGoLive will not rent or sell potentially personally-identifying and personally-identifying information to anyone. Other than to its employees, contractors and affiliated organizations, as described above, QGoLive discloses potentially personally-identifying and personally-identifying information only in response to a subpoena, court order or other governmental request, or when QGoLive believes in good faith that disclosure is reasonably necessary to protect the property or rights of QGoLive, third parties or the public at large. If you are a registered user of an QGoLive website and have supplied your email address, QGoLive may occasionally send you an email to tell you about new features, solicit your feedback, or just keep you up to date with what's going on with QGoLive and our products. If you send us a request (for example via email or via one of our feedback mechanisms), we reserve the right to publish it in order to help us clarify or respond to your request or to help us support other users. QGoLive takes all measures reasonably necessary to protect against the unauthorized access, use, alteration or destruction of potentially personally-identifying and personally-identifying information. If QGoLive, or substantially all of its assets, were acquired, or in the unlikely event that QGoLive goes out of business or enters bankruptcy, user information would be one of the assets that is transferred or acquired by a third party. You acknowledge that such transfers may occur, and that any acquirer of QGoLive may continue to use your personal information as set forth in this policy.